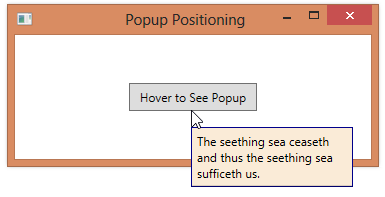 You can use the Placement property of a Popup to indicate how the popup should be positioned relative to the current mouse pointer. You can use one of the values listed below for the Placement property. Note that there are other possible values for the Placement property. The subset listed below are the ones used to position the popup relative to the mouse pointer.